It turns out that when you throw just one coin into the Trevi Fountain it does work (even when it’s under construction). In other words, I was able to visit Rome again. Last time I went was slightly less than a year ago. My mom and I went for a week, and it was potentially one of the nicest trips I had ever been on. This trip was just as nice, but for completely different reasons. I am utterly convinced that everything my mom and I had done in a week we were able to fit into two days, although less extensively. First things first was getting to Rome. We thought we were going to have class and/or a company visit on Friday, so we booked a later flight only to find out that we didn’t have anything, and could have gone earlier. Then, upon arrival of the airport, we found that our flight was delayed an hour. But nevertheless we managed to get to Rome, although finding our driver was tough because a fire had broken out in Terminal Three roughly two weeks prior, so everything that was supposed to be there was moved, causing confusion. Because we got to our hotel so late we ended up heading to a restaurant close by and going to bed early to be ready for the day ahead (smart decision it turned out, as I walked over 11 miles the next day). The first day we woke up super early so that my one friend could go shopping. I figured it was a good time to get it out of the way (I’m not the biggest shopping fan), because we had tickets to skip the line for the Vatican Museum at 1pm, and our hotel was so close to the Vatican it didn’t make sense to leave the area just to come back. The last time I visited the Vatican I had a completely different experience. I was on a tour, with my grandfather and his girlfriend as well as my mom, and this time I was with my two friends independently. I liked how I had done the tour once before, so that I knew some of the cooler facts about the works of art I was seeing, but this time I was able to set my own pace. 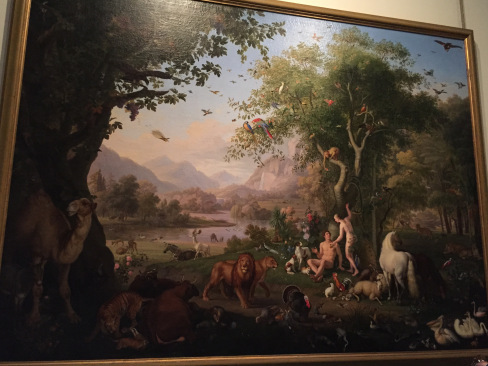 I’m pretty sure that we were able to see more this time around too, as I was able to see a pretty cool painting that I definitely would have recalled from the last time. 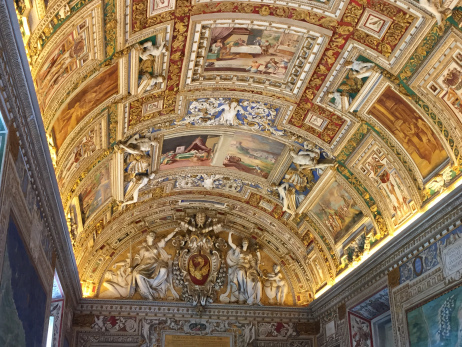 We explored the gardens of the Vatican, went through pretty much every room, and then headed over to the Sistine Chapel. I like the art in the Sistine Chapel, but to be honest I enjoy the art on the way there more. There is one hall you pass through to get to the Chapel that has paintings on the ceiling in frames, and I personally find it to be one of the coolest rooms I’ve been in. 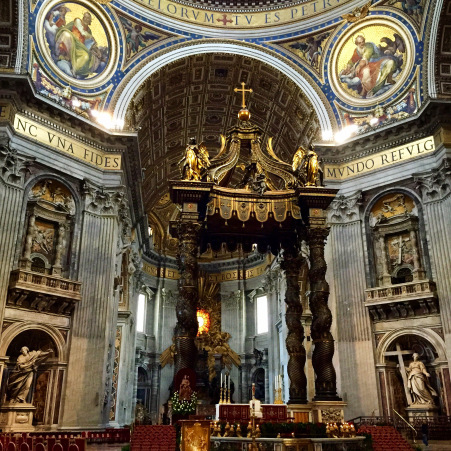 After we toured the Sistine Chapel my group broke, with my friend Lauren and I heading over to St. Peter’s Basilica. I personally find this church to be one of the most beautiful landmarks in the world. I’m not super religious, but I still appreciate the magnificence of the church. I found it extra exciting to be with someone who had never gone before, as Lauren had no idea what to expect walking into the church. My favorite part of the basilica is probably the alter, I find it absolutely stunning, but I also find it interesting how some of the art on the walls isn’t actually a painting, but rather is a mosaic tiling masterpiece. After we had our fill of St. Peter’s (if such a thing is even possible) we met back up at the hotel and went towards the Trevi Fountain and the Pantheon. Last time I stayed I was right near the Trevi Fountain, so it was interesting to find that I still remembered how to get from the metro stop to the fountain and the Pantheon without needing to reference a map. 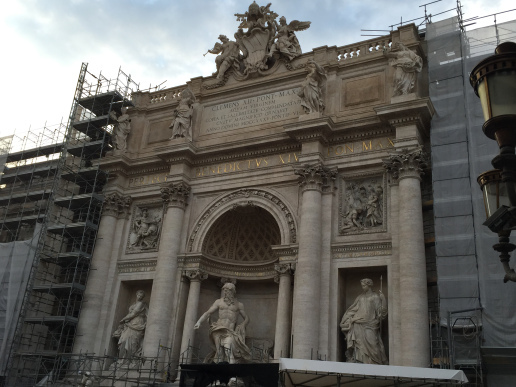 The last time I was in Rome the Trevi Fountain was being worked on, which I found particularly heart wrenching because it was one of the things I was most anticipating. This time it was still being worked on, but many an improvement had been made, so the largest section of the fountain was visible. I may have literally jumped for joy when I saw the fountain, as I had heard it was still being worked on and was worried I would never be able to see the Trevi Fountain in any of its glory. Walking to the Pantheon from the Trevi Fountain came back to me quickly, and the Pantheon was just as beautiful as the last time I saw it. I don’t particularly know what it is about this building, but for some reason I absolutely adore the Pantheon. It’s not even the interior, although that is magnificent as well, or the fact that when it rains the hole in the center allows for it to fall into the building without flooding it, although I also find that incredible interesting. There is just something about the Pantheon that commands attention, at least for me. 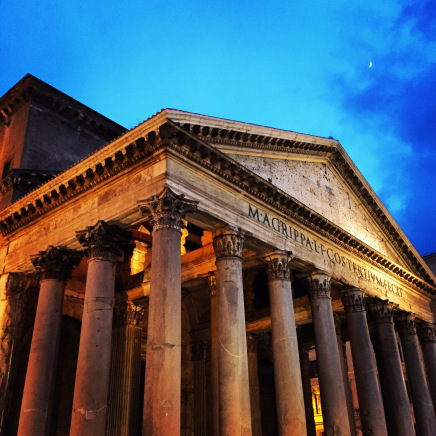 We ate dinner along a side street near the Pantheon which I was pleased about, because then we were able to see it during the day and again at night, when I find it most beautiful. We went back to the area around the Pantheon again around lunchtime, and this time we were able to go inside the Pantheon which was cool. We had to wait a bit as there was a celebration of sorts inside, one that involved what we believed to be roses falling through the hole in the ceiling (as there were roses all over the floor and a few petals drifting down every once in a while, no confirmation on whether that was the actual event). For lunch we went to I Vicini, a restaurant Lauren’s mother recommended that was fantastic. 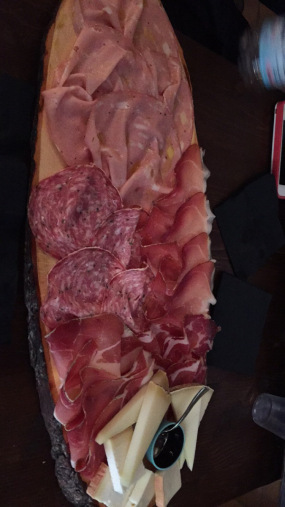 We got a cold cut and cheese platter to share, and it was probably one of the best dishes I’ve had since coming to Europe. It wasn’t necessarily that it was elaborate, as some of the dishes in Rome were, but it was so basic yet so fantastic, a lunch that made me truly feel as though I were getting an authentic Italian experience. For the afternoon we had miscellaneous places we wanted to see, but nothing as demanding as what we had done the previous 36 hours. We walked along the Ponte Margherita bridge and into Piazza del Popolo which was nice for a break. 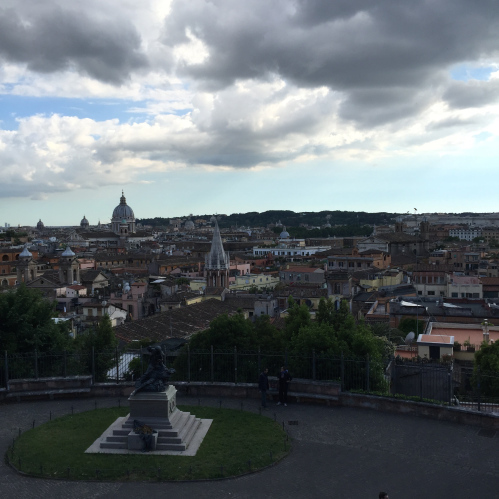 We didn’t stay too long in the piazza, but we walked up the hill into the gardens, for an amazing view of the city. The Spanish Steps weren’t too far, so we walked through the garden towards the steps. I personally have seen the Spanish Steps twice and have been underwhelmed both times, but they are being worked on so maybe when they are fully completed they are more striking. It’s worth the trek for the view alone however. 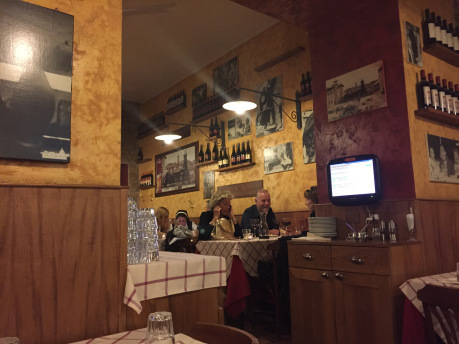 We got hungry shortly after all of our walking, so we headed to the bus station to take us to the area near Ponte Sisto, which one of my friends who lives near Rome said had wonderful restaurants. 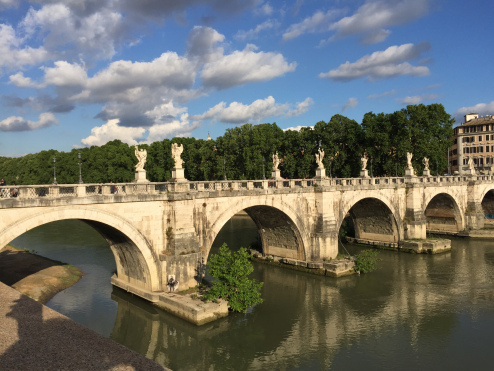 It took us a bit to find the bus station, but along the way we were able to accidentally see some pretty amazing things, such as Castel Sant’ Angelo, and two bridges, Ponte Vittorio Emanuele II and Ponte Sant’ Angelo. I personally loved Ponte Sant’ Angelo’s sculptures, it was nice standing by the bridge and overlooking some amazing sculptures while the river reflected our surroundings. Dinner was absolutely amazing. I couldn’t for the life of me remember where it was, but I had a fantastic meal. Lauren, Emily and I decided to split all of our meals, so we could taste a little of everything before leaving. Emily got a chicken parmesan which was prepared almost like baked ziti, I got gnocchi, and Lauren got a penne alla vodka. For starters Lauren and I split a bruschetta, and for dessert Emily got a tiramisu and I got some chocolate mousse which we all shared. It was a fantastic end to a wonderful trip, and I am glad to say that while my second trip to Rome was completely different than my first, it was in no way worse than my first – if anything, it reconfirmed how amazing the city is. 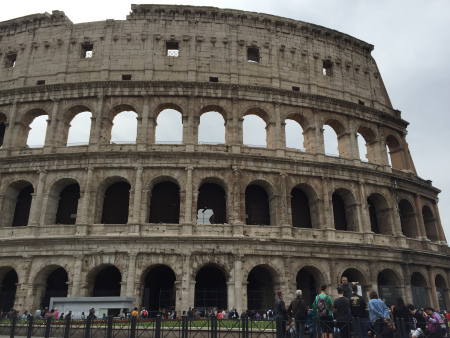 This entry was posted in Europe, Travel and tagged colosseum, italy, pantheon, ponte-sant'-angelo, rome-attractions, rome-in-a-day, sistine-chapel, spanish-steps, st-peters-basilica, trevi-fountain, vatican. Bookmark the permalink.